Discussion in 'Scotland' started by frasermc, Jul 17, 2010. May as well start this thread again for the new season. As Celtic and Rangers already have their own threads I'll just give a quick run down of the other teams in the SPL. There's every chance once Yankhibee comes out of his alcohol induced coma that he'll start a Hibs thread but I'll add them in as well on this. McGhee had a terrible first season with Aberdeen finishing way back in 9th. They've lost Mulgrew which is a blow. Kerr was a regular last season as well but he was never any better than average throughout the season. Only signings of note are a couple of young N.Ireland internationals. Could be another tough season. A third place finish and the Scottish Cup in the trophy cabinet. Houston has given himself a hard act to follow this season. A quiet start to the transfer window may be a good thing as it'll mean keeping his successful side together for the season ahead. A reasonable 7th place for Hamilton last season. Billy Reid will be hoping to try and break into the top 6 this year. Gavin Skelton will offer alternatives at CB while Jack Ross brings plenty of experience to the right back position. Another manager bit the dust under Mad Vlad last year. Will Jeffries fair any better this coming season? Kevin Kyle and Darren Barr will make an immediate difference to the team. And although ex-captain Michael Stewart has left his performances were on the down slide anyway. Hibs looked as if they were heading for a very good season but they fell away badly in the last few months of the season. So much so that Hughes's position as manager was cast into doubt. De Graaf looks like an interesting signing and Hughes has been making complimentary noises regarding young CB Stephens. A better end to the season could see them rise higher than last seasons 4th place finish. Inverness are back in the SPL. And so is their manager. Inverness is never an easy place to visit. Good home form will be the key to survival for them this season. Will the young Israeli attacking midfielder Blumenshtein be able to shine in the SPL? Killie stayed up by the skin of their teeth last season. Jimmy Calderwood didn't fancy another struggle so Mixu Paatelainen steps in. He didn't do very well at Hibs in his one other managerial stint in the SPL. And his job wasn't made any easier when Kevin Kyle moved to Hearts. With no money available it looks like the Ayrshire club will start the season as relegation favourites. Ex Scotland manager Craig Brown did a great job with Motherwell last season. The team ran out of gas a bit towards the end of the season but overall, they had a good campaign. Giles Coke and Jim O'Brien have moved south but the nucleus of last seasons side is still in place. But they are sure to miss the goals and play of loan signing Lucas Jutkiewicz, who has returned to Everton. A good return to SPL football for St.Johnstone last season. Now they need to consolidate and try and build on last year. Parkin and Dobie will offer competition and experience to the striking options. After 7yrs in charge of St.Mirren Gus Macpherson was given the elbow at the end of last season. The new man, Danny Lennon, has been busy on the transfer front so far. But the team looks weaker with the departures of Ross, Mehmet and especially Dorman. Lennon has scoured the lower leagues for players and in particular his former club, Cowdenbeath. But it remains to be seen how well these players will perform in the SPL. It could be a long season ahead for the St.Mirren support. Reid says no to Swansea City. Swansea City finished seventh in the Championship last season, just a point behind Blackpool, who are now in the Premier League. Their average home crowd is around 15,000, higher than those of any Scottish club beyond you-know-who. Last week they sought permission to approach Billy Reid about being their new manager. Reid politely declined. He didn’t even want to speak to them. Either Reid’s ties to Hamilton are far, far stronger than any of us realise or something’s not right at Swansea. It’s excellent to see the relentless drain of Scottish football talent obstructed for once, but a few folk are scratching their heads over this one. Still, good for the Accies. MYSTERY today surrounded the whereabouts of Hibs star Sol Bamba after the Ivory Coast defender failed to report to the Easter Road club's training camp here in the Netherlands as planned. As we all sort of knew James McArthur has followed his ex-Hamilton teammate, James McCarthy to Wigan for a fee around the £500k mark. McCarthy bided his time and, towards the end of the season, he started to get a regular start and seemed to take his opportunities that were given to him. Hopefully McArthur can do the same. Can only be good for the national team if he does. Hearts striker Kevin Kyle is likely to miss the start of the season as he requires an operation on a knee injury. He joins fellow forward Andrew Driver on the sidelines for the start of the new Scottish Premier League campaign. dundee united for the league. Hmmm, interesting stuff with a bulk of latest information. Thanks guys! Aberdeen have signed Paul Hartley on a two-year contract and made the Scotland midfielder their new club captain. Nice move by McGhee. Probably the best signing he's made since being manager of Aberdeen. Aberdeen are looking to move to a new stadium. A planning application for Aberdeen Football Club's new stadium has been lodged with the city council. 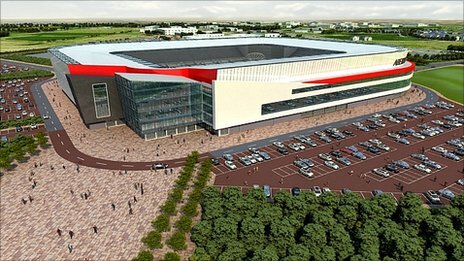 The Dons hope to build the stadium, capable of holding about 21,000 people at a cost of up to £40m, at Loriston Loch in the south of the city. The whole facility would be lit by a red glow at night. They have big designs and are looking to mirror the Allianz Arena's night time ambiance. Are they actually going to be able to pull that off? I suppose it would be doable depending on what they can get for Pittodrie. It's in the sort of location near enough to the city centre and in the middle of a housing development that it would entice either property or retail market developers. Well, my increasingly uninformed and outside perception and market sense: if the non-OF wants to make a run at being more than amateur squads with four or five pros on hire, now is the time to do it. Rangers finances are bad enough that if a few clubs invest enough into infrastructure the long term outlook for those clubs could be very good. Hibs, Aberdeen, and even Hearts seem to be understanding that now is the time to invest there rather than in players. I have to agree. In my perfect world Celtic would win every game they play in but a stronger SPL can only be a good thing for the game as a whole in this country. And I get far more satisfaction coming out of Celtic Park after seeing my team win a game where the other team had a go and gave a good account of themselves. looks like it could be a very nice stadium and i hope it works out. i like the old fashioned, traditional grounds, but i think it makes a lot of sense for aberdeen to build a new place. makes the league look a lot better too. Well's new keeper, Darren Randolph, kept the match tight with a string of excellent saves but Hibs deserved the win overall on chances created. Stokes off the mark early. Possible top SPL goalscorer...? New Dons captain scores the first ever hattrick of pens in SPL history. Will Hamilton's outgoing transfers over the last couple of seasons (McCarthy & McArthur in particular) finally catch up with them? Hearts should have won this, especially when St Johnstone went down to 10 men after a crude tackle from behind by Steven Anderson on Suso but couldn't get the 2nd goal. Wallace and Templeton combined well down the left flank for Hearts for most of the match and Elliot scored from a left wing near post cross by Wallace. A great goal by Sean Lynch nearly won this game for St Mirren but that would have been hard on Utd who, with Craig Conway picking up where he left off at the end of last season, did more than enough to win the match. Utd eventually equalised in the 89th minute when Jon Daly pounced on a mistake in the box to level the score. Aberdeen reverted to type after a good start to the season by losing at home to winless Kilmarnock. The goal was a defensive disaster for Mark Howard and Rory McArdle as hesitation between the both let in Jamie Hamill for his 2nd goal of the season. That equals the amount he scored in the league for all of last season. If any team needed a win badly it was Hamilton and they got it through ex-ICT player Dougie Imrie who scored the only goal of the game after just 40secs. David Templeton continued his fine start to the season by putting Hearts in front but Morgaro Gomis levelled the score with an early contender for goal of the season as he rocketed a half volley from 25yds out into the top corner. Troubles continue to mount for John Hughes with another disappointing display and defeat. This time at the hands of St Mirren who are off to a good start. And if Craig Dargo can start hitting the goal trail regularly then the doom and gloom merchants may have to divert their attention elsewhere. Perhaps in the direction of Leith. With Anthony Stokes heading to Celtic and Darryl Duffy coming in as a replacement it looks like tough times are ahead, unless Petrie allows some, or all, of the Stokes cash to be spent on reinforcements tomorrow. Scottish second division side Airdrie United have apologised after inadvertently using pictures of Nazi soldiers on the cover of their matchday programme the day before Remembrance Day. Has George Peat returned to his former stomping ground...? Good match live on TV here today......Dumfermline v Hibs......typical fast paced, physical brand of football but lots of goalmouth incidents. Fantastic League Cup Final today between the Jambos and the Buddies. Fantastic advertizement for the Scottish game, with St Mirren winning 3-2, and Hearts came so close to levelling it up and pushing it into extra time. The thing I noticed yesterday was there were two games in Scotland, neither Celtic nor Rangers were involved in either of them and the average attendance was over 27k. I know they were both special matches but this does reinforce the notion that if you can get some competitive balance, get to the point where the matches "mean something" there is support out there for the clubs. That is two years in a row Hearts have taken over 25k to cup finals at Hampden Park..........not sure that club should ever have financial difficulties! I managed to watch the full match last night. Agree with the above. Very enjoyable game. Good spectacle. St Mirren have played some nice football this season, clearly seen in their equalising goal. All three goals were pretty good actually. Nice 1-2 and finish for the 3rd as well. Not many people down in Newcastle know a lot about Conor Newton but any highlights I've seen of St Mirren recently he has impressed.